With characteristic pomp, Turkmenistan unveiled an idiosyncratic new airport terminal in the capital shaped like a falcon thrusting through desert air, to acclaim last year. And now, if a report in RFE/RL’s Turkmen service Radio Azatlyk is to believed, the $2.3 billion building in Ashgabat is slowly sinking into the sand. Azatlyk reported on January 13 that representatives from Turkish construction company Polimeks, which built the terminal, have been summoned to President Gurbanguly Berdymukhamedov to answer for themselves. And, perhaps more importantly, to explain how this news got into the media in the first place. Azatlyk cited its source as saying that a special commission has been set up to study the subsidence and come up with ways of resolving the issue. French construction giant Bouygues, which was also involved in building the terminal, has been drafted to effect repairs. Problems apparently began to appear in December, when sheets of glass fell out of place and communication cables began to fail. 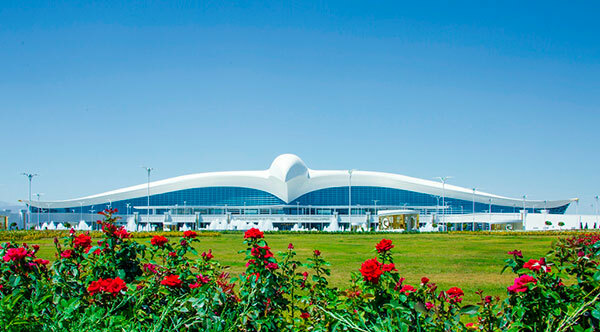 The airport was built in preparation for the 2nd edition of the Asian Indoor and Martial Arts Games — a 10-day event due to take place in September. A website dedicated to the games is up and going and counting down the seconds to the event kicking off. These multiple transgressions might ordinarily lead to firing galore, but with the presidential elections due on February 12, it is more likely that Berdymukhamedov will keep his powder dry until then and then reshuffle the Cabinet. Either way, somebody will have to pay.